Thanks for taking the time to look at my visual resume. This was my first piece of major work using Adobe Illustrator. I have been a developer for the past 5 years of my career this is my first foray into the design world. 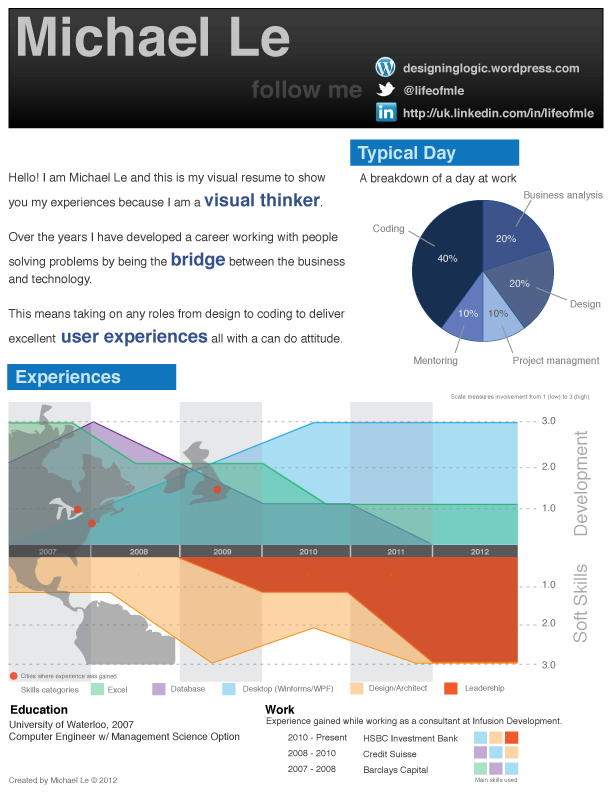 I remember back in 2009 I saw my first visual resume from Michael Anderson and I thought that was very interesting way to display information. Over the years data visualizations have become evermore prevalent on websites such as Bloomberg and the New York Times. One key site is a source of my inspiration/ideas and that is one of Nathan Yau who blogs for Flowing Data. If you want to see more of how I created this visualization, click here to see the making of. What did I want to say? And how? I didn’t want to just list all of my work down as a traditional resume. I wanted to “highlight” my skills and I did that with different size fonts in the summary area. I have been fortunate enough in life to have opportunities to work in great cities such as New York City and London. I figured I would empathize that international experience by using a map. I overlaid area charts on top to show my experience over time over those places. Rather than listing every little thing I worked on in the mainly focused on what I worked on at a high level. By simplifying my work experience into simpler categories of “Excel”, “Databases”, “Desktop”, “Architect/Design” and “Leadership”, I can easily tell a story of how my career has transformed over the years. By looking at everything at a high level I have created the concept of a “career swatch”. A career swatch is a set of blocks illustrating what I did so far in my career by symbolizing major works/responsibilities in each project as a different colour.